Jockey Club "Blue House Studio"
The ground floor shop at No. 72A, Blue House now accommodated "Hong Kong House of Stories" (formerly " Wanchai Livelihood Place"). Hong Kong House of Stories aims at assembling multiple cultures from the community. With community participation and support from different partners, it frequently organizes a variety of community cultural events promoting local culture, including exhibitions, workshops, community guided tours and more. Community art and culture activities including film shows, music concerts are also arranged as a way to revitalize the community. 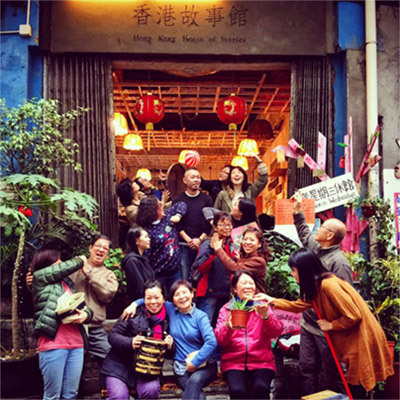 As a community platform, Hong Kong House of Stories enhances interaction and exchange within. Copyright © 2019 Blue House. All Right Reserved.